We provide private Cognitive Behavioural Therapy (CBT) in Woking, Godalming, Guildford and South Croydon. This includes treatment for a wide range of problems including Generalised Anxiety Disorder, Health Anxiety, Panic Disorder, OCD, Social Anxiety, PTSD, Phobias, low self-esteem, insomnia and depression. If you are experiencing problems with anxiety or depressed mood, are stressed at work or having difficulties at home or in key relationships, contact us on 01732 808 626 or email info@thinkcbt.com to organise a local CBT appointment. Daytime appointments in Godalming and Guilford cost just £69. You can make a fast and confidential appointment with a fully qualified and BABCP accredited Cognitive Behavioural Therapy expert. You will not find professionally accredited CBT in Surrey for less. Contact us today to talk to a member of the team and book a CBT appointment. We offer Cognitive Behavioural Therapy, counselling and psychological services using only fully qualified and professionally accredited CBT specialists. We work to the standards and ethics laid down by the British Association of Behavioural and Cognitive Psychotherapy (BABCP) and our therapists have extensive experience working within the NHS and private sector. You can view the detailed profiles for our Surrey CBT experts Clare Kane, Ewelina Konobrodzka and Suheyla Hussein here. Immediate access to CBT experts without waiting-lists or formal medical referrals. 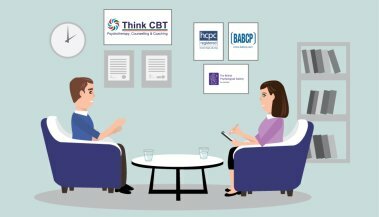 The latest CBT techniques drawn from a range of cutting-edge therapy models. Flexible appointment times including early mornings, evenings and weekends. A free initial call with your therapist, psychological testing and lapse prevention plan.